In January 2015, the Grateful Dead announced they would come together in July for their final “Fare Thee Well” tour. 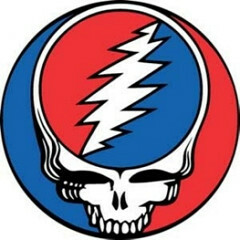 The tour marked the Dead’s fiftieth anniversary as well as the twentieth anniversary of Jerry Garcia’s death in August 1995. The band’s “Core Four” original members— Bob Weir, Phil Lesh, Bill Kreutzmann and Mickey Hart—would appear on stage one last time, with Trey Anastasio of Phish standing in the late Jerry Garcia’s place. A family reunited, though its most beloved brother will be absent. I read Browne’s Rolling Stone article about the “Fare Thee Well” tour when it came out the first week in June. I had gotten the issue from my neighbor, a retired barber who hands me a stack of magazines each week, subscriptions rerouted to his house after he closed up shop. Though I’ve been to a few Grateful Dead concerts, I am not a Deadhead, nor am I a scholar of the band’s fifty-year history this final tour commemorates. My only connection to the Grateful Dead is through my older brother, David. I wondered whether he’d bought a ticket to one of the five shows—three at Soldier Field in Chicago and two at Levi’s Stadium in Santa Clara, CA—or if he planned to watch a simulcast of the concert in a movie theater or on pay-per-view. My best guess was he would shun the event altogether, based on an unwavering belief that the Grateful Dead died with Jerry, though this was only speculation on my part. What I did know was, when David turns sixty this coming November, I wouldn’t call him or send a card. I hadn’t spoken to David in over five years. Neither had my parents. Like most families, the personal dynamics of ours are complicated. When I told an old friend from high school I’d stopped speaking to my brother David, she was surprised. “I forgot you had another brother,” she said. She’d never met him, nor had any of my friends. Once David was gone, he stayed gone. He moved a thousand miles north to Seattle after college and graduate school and came home to Southern California once a year, usually in the winter when he needed a sun break from the endless gray. He was living with a woman we had met a few times, though I was the first—and for a long time, the only—one in the family to dislike her. My parents chalked this up to my judgmental tendencies, a criticism I’d borne since my early teens. Still, I kept my distance. Only later did the rest of my family recognize what I had known for several years: this woman was scary. They caught glimpses of her that concerned them—her subtle racism and her mean streak fueled by alcohol. I gathered these details from the stories that followed their long phone calls and short visits. To be fair, his girlfriend became a convenient place to lay our disappointment in David, the black sheep in our family long before he’d even met her. Or perhaps she was like licorice, someone we never developed a taste for. What my brother David had with his girlfriend seemed to work, and so, after living together for twenty years, they got married, a decision my brother insisted was motivated by tax advantages and powers-of-attorney rather than the esteemed institution of marriage. He used this rationale to explain their choice of a courthouse ceremony without a single family member invited to witness the event. We learned about their marriage four months later. My parents and I were out to lunch with my brother during one of his winter visits. I was the first to notice his gold wedding band. When I asked him about it, David shot me a dirty look before he began his explanation. David’s wife shared his need for order and ritual and rules. Example: a visit my parents paid them five years ago. My eighty-year-old mother and father had to remove their shoes before entering the house. The fact that they were shivering—the thermostat never rose above 68 degrees—and unsteady on the waxed wood floors in their stocking feet left no visible impression on my brother and his wife. Instead, they focused on my mother’s chronic cough, an ailment that embarrassed her whenever an uncontrollable fit took hold. She’d seen several specialists but none were able to find a cause. Two days before my parents were to leave, my mother ran to my father in tears, upset by a conversation with her daughter-in-law, the kind that seemed a serious transgression at the time but now sounds ridiculous in its retelling. David’s wife had pressed my mother about the cough, insisting she wasn’t taking proper care of herself. That was when the axe fell, the camel broke, and the dam burst. My father let loose the truth, withheld for nearly thirty years: though they had pretended otherwise out of politeness, they’d never liked David’s wife. That this spilling came from my father seemed to hurt David even more. The next day he drove my parents to the airport; this was the last time they’d see—or speak to—each other for five years. Instead, David launched a barrage of lengthy emails. The first two landed in my father’s inbox before their plane touched down in L.A. I was enlisted to make sense of his writing—to unravel the convoluted syntax and slog through the sort of gobbledygook my freshmen students were proud of until I took a red pen to it. My parents needed a ghost writer to respond to David’s stream of emails, and I was the most logical choice. I became their advocate. In order to fulfill this role, I had to break with the enemy, a sacrifice I felt little pause in making. My brother’s life was governed by a definitive, his-way-or-the-highway philosophy. David applied a fastidious approach to most tasks, such as when he taught me, his youngest sibling, the correct way to mop a floor or make a bed. To this day, because of David, I wash my can opener after each use. A number of years ago, when I was in graduate school, he asked me how he should go about writing a short story. I couldn’t deliver an answer that satisfied him, one that clearly outlined the process in detailed, numbered steps. There were no gray areas in my brother’s world, no open space for uncertainty. Given his rigid nature, my brother’s love for the Dead, a band whose music was built on experimentation and messy improvisation, seemed incongruous to his core being. In the summer of 1977, during a visit home from college, David introduced me to the Grateful Dead. 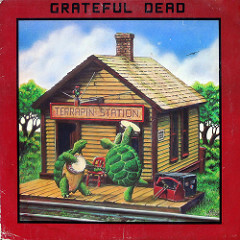 He sat me down on the living room sofa, put the cover to Terrapin Station in my hands, and told me not to get up until I’d listened to the entire record. He said if I concentrated very hard, I could isolate each instrument—guitar, bass, keyboards—and follow its journey through a song. Instead, I focused on the album’s cover, making up stories in my head about the two turtles dancing on the porch of a rickety train station —one with a banjo, the other with a tambourine—and the adventures that laid ahead for them. The last show the Grateful Dead played with Jerry Garcia was in July 1995 at Chicago’s Soldier Field—the final, symbolic stop on this summer’s “Fare Thee Well” tour. Weir recounts for the documentary what happened backstage at the end of the show when he and Garcia exchanged what would be their last words before heading off in different directions home. Garcia clapped Weir on the back and said, “Always a hoot.” One month later, he was gone. I watched the documentary three times, freezing the camera pans of Deadheads out in the audience at historic concerts, searching for my brother David in the swaying ocean of tie dye and wild hair. Our family cabin in the high Sierra is a six-hour drive from Los Angeles. I’m the only one who uses it anymore. I drive up alone every summer, through the Mojave Desert, punching through FM stations in search of classic 70’s rock. Each song reminds me of David, bands he’d once catalogued for me, a list of must-have albums handwritten in even block letters. I spent my summers checking off the list, siphoning off paychecks from jobs selling Birkenstocks and vitamins to buy the canon according to David: Steely Dan, Jethro Tull, anything Clapton or Winwood, and the Grateful Dead’s seminal albums, American Beauty and Workingman’s Dead. David abandoned popular FM favorites, like Bowie and Elton John, after he left for college in 1973. He gave away the black cape he once wore to a Ziggy Stardust concert his senior year in high school, a prop leftover from his time as a magician, working the birthday party circuit for neighborhood kids. He must have discovered the Grateful Dead during his first year at Berkeley, a short distance across the San Francisco bay from Marin County, where the band’s members had lived following the Haight-Ashbury heyday of the late 60’s. Back home, I was left to study Elvis Costello, Talking Heads, and The Cars on my own. David wanted nothing to do with New Wave. Like the Dead’s troubled dynamics after Jerry died, my brother was frozen in time, rejecting most music trends and innovations to surface after 1978. Even the Grateful Dead’s one crossover hit in 1980, “A Touch of Gray” and its video airing hourly on MTV, spurred David’s criticism. My father received a birthday card from David—two weeks late. I had already begun writing this essay, and the Dead had already played their first two concerts at Santa Clara’s Levi’s Stadium and were packing up for Chicago. My parents and I had just gotten home from my father’s appointment with his oncologist. His latest PSA counts were bouncing around, and the doctor wanted to wait one more month to see if the numbers settled; if they didn’t, the plan was to move on to a new drug. If that didn’t work, there was still chemotherapy. My father pulled over at the end of the driveway so I could get the mail. I was the first to see the envelope. David had written my father’s name in those same small block letters. He’d included Dad’s middle name—though misspelled—as if to add flourish and formality to the event of writing our father on his 85th birthday. The card was a painting by Winslow Homer of an empty rowboat adrift on a white-capped sea. Inside was a letter, typed in a small, sans serif font similar to my brother’s handwriting. The letter David wrote had been encouraged by my other two siblings, who had quietly maintained their relationships with him over the last five years. Like drummers, my eldest brother and my sister kept the family heart beating, transmitting updates to David on our mother’s rapid memory loss and our father’s prostate cancer. As for me, there wasn’t much to report; I was careful to withhold certain details that might make their way to David—a published essay or story he might find through a few Internet searches and discover the impact his absence still had on me. As my father read the letter aloud to my mother and me, I was mentally editing David’s tangled syntax, occasional clichés, and a lengthy admission of his limitations, his weaknesses, and his flaws, as though the five years of silence were beyond his power to overcome. He could not bring himself to call; even writing this letter was a trial—I am quoting directly here. Looking back, I imagine what David may have feared most: the very likely possibility that he would lose our father—our leader, our compass, our small band’s Jerry—without the chance to say goodbye. The letter was an ice breaker, my parents believed, an olive branch that needed reciprocation. Two days later, my father announced he was going to phone David and headed upstairs to his office with a gin and tonic to make the call. My mother and I stayed downstairs, stretched out side-by-side on my parents’ bed. Out of habit, I pushed up my sleeve so she could tickle my arm as we talked. I chose our topics carefully now, reaching back sixty-five years for details about her wedding day and the buffet my grandmother had cooked for a hundred guests rather than ask about an ailing aunt my mother had spoken to just this afternoon. The distant past somehow had moved closer, edging into the space her short-term memory once filled. We could hear my father upstairs, his voice a little high—light and breezy, as I’d instructed. My mother asked who Dad was talking to, and when I reminded her, she stopped tickling my arm. She was hurt that my father hadn’t told her he was going to call David. And so we went for thirty minutes or so, weaving back and forth from roast turkey and a three-tiered wedding cake to how long my father had been on the phone, and did I know who he was talking to. Dad came downstairs, his glass empty, and sat down on the little red folding chair he used to put on his shoes each morning, teetering some now, whether from the gin and tonic or from the stress of the conversation, I’m still not sure. My father perched on his tiny red folding chair and reconstructed the conversation for my mother and me. David wanted to know if the cancer had changed my father, if he looked at life differently now. What my brother should have asked was how the last five years had changed our father—changed our family—though this would have been too hard for any of us to answer. And so will be the future following my brother’s card: a twilight consolation, a small relief before we reach what waits ahead—something that will never be the same. LORI WHITE earned her MFA in Creative Writing from Antioch University Los Angeles. Her recent work has appeared in The Boiler, Pithead Chapel, and Sequestrum. Her story, "Gambling One Ridge Away," won first place in the 2013 Press 53 Open Award for Flash Fiction. She teaches English composition at Los Angeles Pierce College and Oxnard College.